Years ago when I first got my Cricut I remember hearing about nugget tins that people were making and I never bit the bullet and jumped on that bandwagon. That has now changed!! 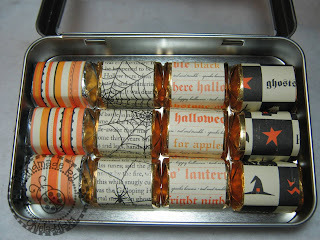 My friend Amy, aka Scraparazzi, recently did a share on nugget tins and I figured I might try some to so I could have quick gifts for minor occasions. The problem seems to be that the nuggets disappear before they make it to the tin and given to friends *okie so wishes Lucy didn't like chocolate since she knows that has to be where they are going*. I know it is a bit late for posting a Halloween project, or it is very very early, which ever I am doing it now because that is how I roll! I made a few of these for some of the workers at McCalls, the ICF/MR where I see clients. The ones I gave them to are always wonderful on consulting and collaborating with me on the therapy of the residents on my caseload and I wanted to give them a little thank you. I chose this stamp since it seemed to be rather humorously appropriate due to my job title, and the receivers got a kick out of it as well! One great thing I love about using the CTMH Cricut cartridges are the awesome stamps that coordinate with! It is super easy to line them up and the images stamp so clear. I used Design Studio to make a shadow for the label and making the spider web border the length I needed. I pop dotted the label on the ban and made the ban where it could just slide off and on. On another cut file I have loaded in this computer I have the strips designed for DS to cut them. 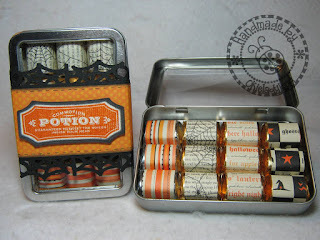 For these tins I just cut them with my paper cutter. I liked using the Making Memories 6x6 pad because it allowed me to just cut 1x3 in strips from each sheet and not waste anything. I had asked on Facebook about the nuggets sliding around and one of my FB friends said she just adds a Glue Dot to the bottom of each one to keep them in place. This worked like a charm! 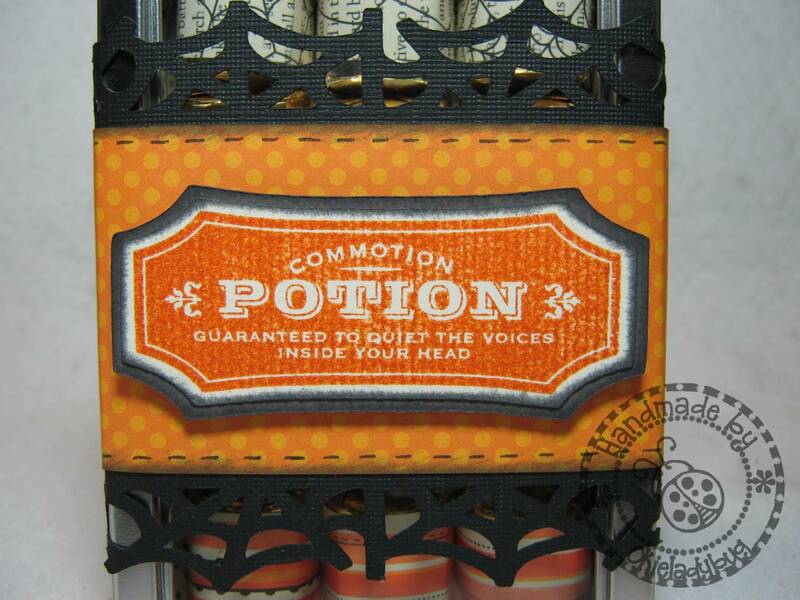 I got very nice compliments on the tins when I gave them away, also accompanied one of the WICKED HALLOWEEN cards that I had made last year, and I felt it made it well worth the effort. One of the ladies just kept saying "you made that" "you really made that" and I kept telling her yes. She said "well I have never seen anything quite like it. That must have taken a very long time" and I told her it doesn't really take too long and tried to explain the Cricut to her to which she replied "We really gotta find you a man". I told her "yeah I tried that, believe me I get a lot more pleasure from my Cricut". I thought she was gonna choke from laughing so hard! 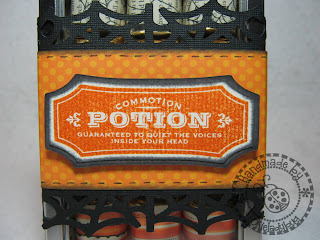 I have that same stamp set from CTMH and just love it. Your tins are fabulous! I love the way you stretched out the spider web to make a border. Wow, Okie! I really like this. I may do this as part of my Christmas gifts. You rock! I've had my eye on that stamp set. Love your project! 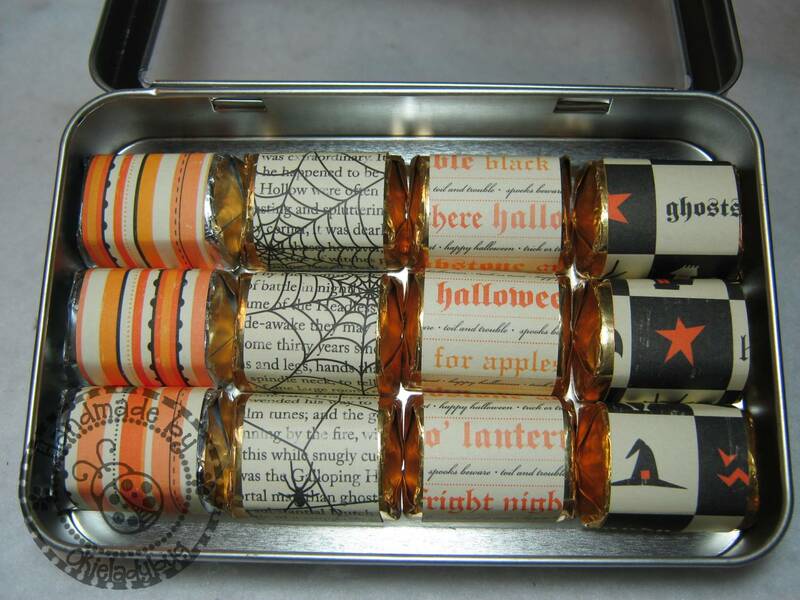 I really like your cute Halloween tins and cute labels, Okie! Do you possibly have a cricut file to share? I have never heard of nugget tins--but I see many in my future! Thanks for sharing this great "little" idea! I think that this can be a "special" treat for many different occasions.